Against Saigon’s neon skyline, five men hopped atop Air 360 Sky Lounge's outdoor rooftop bar in District 1 began to gyrate in tune with the raucous hip-hop blaring out the speakers, starting their special dance. With sweat-glistened muscles flexing, they performed a precisely choreographed routine that included dropping to handstands, leaping, spinning and the suggestive use of a fresh banana that was at one point unceremoniously chomped and tossed into the crowd. By the time flares shot into the sky at the end of the set, the performers had the entire bar’s attention, everyone in awe of the unique show just took place. It served as an ideal example for how the rooftop bar, with its unique 360 degree view, aims to be the go-to sky lounge for events and hanging out for the city’s young and hip generation. As Saigon’s nightlife scene gets more crowded with new clubs, bars and concepts opening every month, Air 360 Sky Lounge sets itself apart through frequent performances like this month’s steamy male dance routine, hip-hop numbers, sultry shows featuring bikini-clad women and private magician performances. Each of these acts occurs once or twice a month and coincide with weekly events such as the daily Golden Happy Hour (Daily) when guests can enjoy discount drinks set against a stunning sunset, Hip Hop For Hunger on Wednesdays, La Belle - Ladies Night every Thursday, Friday D.I.C.E. when guests can participate in a fun lucky draw and The Act on Saturdays which features a blowout dance show. Stephanie Nguyen, Event Executive, tells Saigoneer that while service remains their number one priority, competition is so stiff in the city that special entertainment can make all the difference for guests when deciding where to go for a night out. She keeps this in mind when working with a number of the city’s top talent providers to select and approve acts for a rotating selection of male and female dancers who perform routines of different genres and concepts including Greek, fairies, and nun. As a hip-hop dancer herself, she is not only an experienced judge of skill but understands the plight of the artists, explaining that by treating them well and paying a fair price, the venue ensures they will put on their best performance. True to its name, Air 360 Sky Lounge offers a remarkable view of Saigon that can be enjoyed from the cool open-air patio, quiet dining area by the pool, and a VIP lounge where guests lounge on plush couches in a quieter atmosphere. The chill, open-air restaurant, Sky Dining, which serves a variety of premium meat and seafood, rice and noodle dishes as well as small plates. The elegant Western and Vietnamese modern fusion cuisine gives diners the needed energy to party during events long into the night. Stephanie says that while the stunning backdrop of Bitexco Tower, iconic Ben Thanh Market and bustling Bui Vien Street brings in locals and foreigners from across Asia, Europe and North America, it also presents a new set of challenges. Unlike clubs with roofs, Air 360 Sky Lounge cannot rely on poles, hanging lights or other elaborate equipment for performances. This means that the dancer themselves have to get creative to pull out the stops, while a rotation of top DJs accompanies these acts. The dedication certainly resonates with guests who always rush to the stage, thrilled by the affairs. Before the male dancers took the stage, women at tables sipped a selection of fruit-forward cocktails made with Hoegaarden Rosé offered as part of the normal Thursday Ladies Night. Drink specials and exclusives are a key component to events at Air 360 Sky Lounge as prepared by expert bartenders who routinely compete in competitions around the city. Au Vu Kieu Oanh, one of the bartenders who advanced to the second round of the Campari Bartender Contest Asia 2018 this month, made Saigoneer a selection of drinks exemplifying the ways beverages compliment special occasions. Mercy Killing, for example, which was designed for Halloween, encased a silky layer of brain-like gray Baileys in bright red grenadine and peach liqueur served in a skull-shaped glass while another concoction placed cherries inside lychee for a sweet representation of gory eyeballs. The signature On The Sky is bright red and effervescently refreshing perfectly suited for a warm evening. The while Flaming Sazerac, which was lit on fire and cascaded down a set of glasses, in contrast, is a bold and charismatic sipper worth saving slowly. Ranging from bitter to sweet, savory to tart, the large drink menu has something unique that will please any pallets. As Women’s Day, Halloween, Christmas, Tet, Valentine’s Day and other holidays approach, Oanh and her colleagues spend days experimenting in the hopes of discovering new liquid accompaniments. 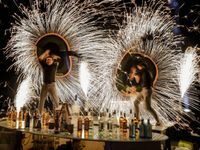 Occasionally, the bartenders hop on the stage itself, offering up a dazzling fire dance with spinning flames and shooting sparks. The cocktail team is currently working on the perfect drink for the 3rd-anniversary party on November 9th. Stephanie explained that they had originally planned for an Adam and Eve theme for the night but expanded it to Garden of the Gods after realizing that including ancient Greek gods would invite for more attire creativity and indulgent extravagances. In addition to special drinks, the venue’s biggest party of the year will also feature dance performances, a fashion show, special guest rapper Bin-Z and Singer Khong Tu Quynh, costumes and golden decorations that fill the venue with fresh plants, lights and an opulence typically reserved for the realms of immortals. In the three years since Air 360 Sky Lounge opened, the city has seen a rush of new spots vying to be the go-to place for dancing, drinking, chatting and partying. The venue is able to celebrate its upcoming anniversary more popular than ever in large part to the weekly events and frequent performances that are accompanied by lavish drinks. In the coming year they plan to do it even bigger, upping the anty on their weekly schedule in a search to be the city’s best skylounge.